Outer Spaces at Milk Run, June 24, 2016. First, let’s put a capstone on last week’s question about who’s running Milk Run. Sam Parker, who was at Friday night’s Milk Run show, made it clear he’s still very much involved with the venue. He’s enlisted members from a few local punk bands (No Thanks and See Through Dresses among them) to help run shows. And that Facebook post asking for people to help book the room was merely a way to give others an opportunity to try their hand at the show promotion game. Parker will continue to book Milk Run, along with his promo company Perpetual Nerves. In fact, Parker mentioned a couple interesting upcoming shows at Milk Run that have yet to be announced, so stay tuned. Missing from the equation is Chris Aponick, who Parker said has stepped away from both Milk Run and Perpetual Nerves for personal reasons. If that wasn’t enough, Parker, who also works at the mysterious Hi-Fi House, has been über busy working on yet another exciting live music project, which you will hear about shortly. 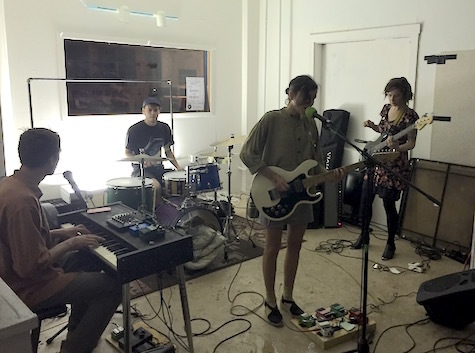 Friday night’s Milk Run show was held not in the micro-sized music room, but the adjacent, larger art gallery. They made the move because the AC in the small room was on the fritz. One reason shows haven’t been held in the gallery was fear of the acoustics — it’s a bigger room with a tin ceiling — but bouncing sound wasn’t a problem for this show. Even with their smallish PA, the room sounded pretty good. So did Outer Spaces. The Baltimore four-piece (looks like they added a new bassist) played a short, sweet set of songs from their just released album, A Shedding Snake (2016, Don Giovanni). On that record, frontwoman/guitarist Cara Beth Satalino has a voice that at times is the spitting image of Edie Brickell’s, at other times she reminds me of Maria Taylor, whereas my wife think she sounds like Anna Waronker (That Dog). Performing live, Satalino has a simple, quiet quality all her own on songs that are classic ’90s-style indie. The live set was more laid-back than what you get on the record, which is one of my favorites from the first half of the year. I told Parker he should use that gallery space for shows more often. In addition to sounding good, it was more comfortable, with plenty of room to move around. No doubt the room’s capacity is twice as much as the small room, and concerns that the gallery would feel empty during small shows was unfounded. Friday night’s show felt well-attended even though only 15 or 20 people were in the audience. The Pale Dian show has been cancelled. Also tonight at The Waiting Room it’s the return of Portland-based indie folk group Blitzen Trapper (Vagrant, Sub Pop). Opening is Frontier Ruckus. $18, 8 p.m. This is the first time I’ve ever said this, but: It looks like it’s going to be another Milk Run weekend. Is this in addition to the folks currently booking Milk Run? I’ve been told by a number of sources that management of Milk Run changed a few weeks ago. I’m not sure who is running it these days. I have a message out to Sam Parker, who, as far as I know, is still associated with the all-ages venue. Well, whoever it is, they have a couple red-hot shows going on this weekend. Tonight, Baltimore band Outer Spaces headlines. The trio released a few EPs and a single on mighty Matador Records prior to their debut LP, A Shedding Snake, on Don Giovanni Records. The opening line-up is stacked with Thick Paint, Anna McClellan and Fullbloods. 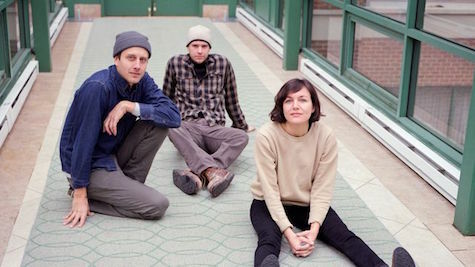 $8, 9 p.m.
Saturday night at Milk Run Portland psych rockers Love Cop headlines. They’ve got releases on Burger and Lollipop Records. It’s another stacked line-up with Well Aimed Arrows, Funeral Gold and AllSortsOfGood. $7, 9 p.m.
Last I heard, Milk Run’s AC was on the fritz. If that’s still the case, it could be a couple hot, stinky nights. There are other shows going on this weekend. Tonight Wichita band The Travel Guide plays at fabulous O’Leavers with Timecat and Fake Plants. $5, 9:30 p.m.
Saturday night, Brothers is hosting experimentalist Bill Nace (half of the duo Body/Head with Kim Gordon ) & Jake Meginsky, Screaming Plastic and Big Slur. 9 p.m. start. I don’t see a price on this, but it’s probably at least $5. Also Saturday night Uh Oh opens for White Wolf T-shirt and Des Moines band Pets with Human Names at O’Leaver’s. $5, 9:30 p.m.
Of course Sunday night is the Peter Bjorn and John concert at The Waiting Room (which I already wrote about here). All Young Girls Are Machine Guns opens at 8 p.m. $20. Also Sunday night, Paul McCartney’s son, James McCartney, plays at Reverb Lounge with Tara Vaughan. 8 p.m., $15.